Smile! I don't mean Sophie, I mean you! Sheep prefer smiling faces over angry or frowning ones. Researchers have studied this very important behavior. Sophie is a "bummer lamb". These are lambs born to a mom who cannot care for them. Farmers rarely spend the time and money to hand-raise an abandoned lamb, so they are often left in the fields to dehydrate and die. Really, that IS a bummer. Smiling is important, because sheep also remember faces. They can remember nearly 100 unique human faces for up to three years. I don't know who came up with the theory that sheep are stupid. Probably someone who presumed that their flocking and following behavior is some magical sign of stupidity. It's actually pretty smart and rather selfish. Sheep flock so that each individual has a higher likelihood of surviving an interaction with a predator...and they will try and shove their way to the center of the flock to increase individual survival rate! 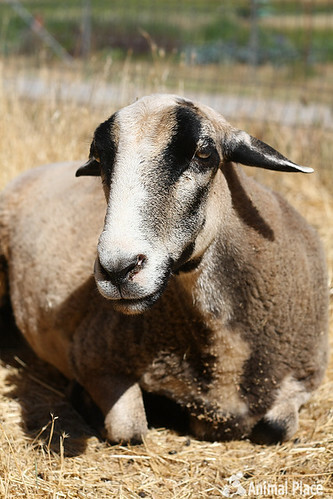 Carmen is a three-legged sheep rescued from a small farm that raised sheep for weed abatement. 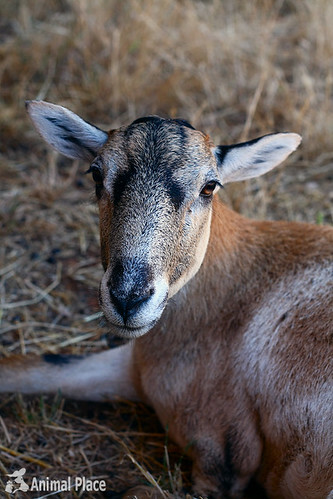 When Carmen broke her leg tripping in a hole, the farmer spent no money or effort on helping her. For two weeks, she hobbled around until a neighbor came to the rescue. After a week of intensive care, we decided to amputate the now dead leg.